Shopping for me is a treasure hunt. I do not have the budget nor the closet space to bring home everything I "like". The items that come home with me have to be serious LOVE status. I had the great pleasure of attending the Nordstrom Rack Market Street store Grand Opening while in San Francisco & it was the ultimate treasure hunt! 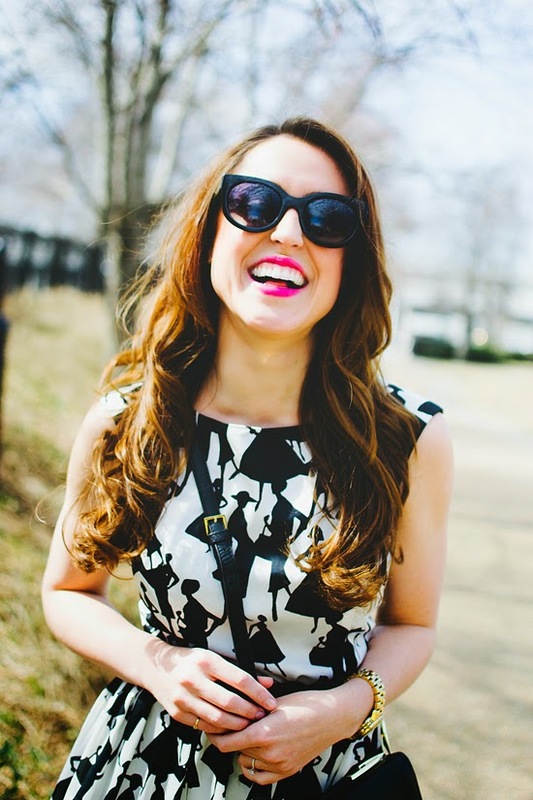 So many designer labels, dreamy Spring pieces & budget friendly finds! It was hard, but I kept my eyes on the prize, looking for a high quality cross-body bag. Pour La Victoire has been on my radar for a while (#wishlist) & I was pleasantly surprised to find a great selection of their bags at the Rack! I had hit the jackpot: classic black, more pockets than I could handle & in soft leather with high quality finishing details. Best part, this bag was originally $325, but the Rack price was $119 - a 60%+ savings! This highly versatile, & budget friendly item was a no-brainer purchase, filling a hole in my closet that will be a go-to bag for YEARS to come. Certainly a piece with a cost per wear of pennies! Have you had a shopping treasure hunt score at Nordstrom Rack? Share your shopping confessions & shopping treasures found at Nordstrom Rack on Instagram using the hashtag #ShopGenius. The best submissions may be featured on Nordstrom Rack’s Instagram account & if you tag me, I will be regramming my favorites as well! Follow along with Nordstrom Rack on Instagram for all the juicy shopping confessions in the months to come. What is your best shopping secret? Any shopping confessions to share?? 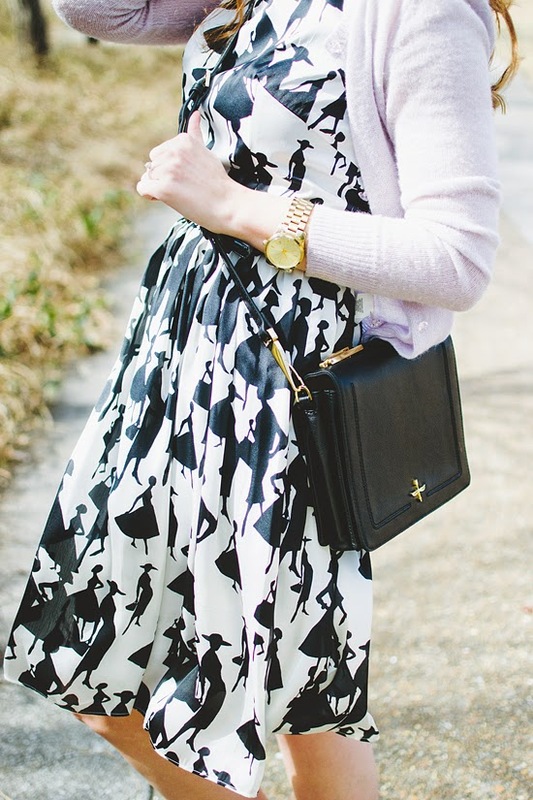 Oh, I love this look - the black and white with the soft lavender is so pretty and perfect. The bag was an amazing find, I love being able to treasure hunt for sales like that! That dress is so adorable-love the ladies on it! And congrats on the savings! I can never pass up a good deal. Gorgeous dress and I love that bag! I've been thinking of selling a Marc Jacobs bag I got a couple years ago and then use the money to get a new designer bag (maybe Rebecca Minkoff) from Nordstrom Rack or TJ Maxx! P.S. The print of this dress is so freaking cool. that dress is sooo lovely! have a great weekend! I've been eyeing that purse up since you first instagrammed it - what a smart purchase to use your giftcard on (lucky!) because like you said, you'll have it forever. Plus once you find a bag that you really love, you'll stop looking at any other ones. I've been using my coach crossbody that I got on etsy for over a year, and usually I would start to get an itch to buy something different, I just love it so much that I don't see myself trying to find something different anytime soon. 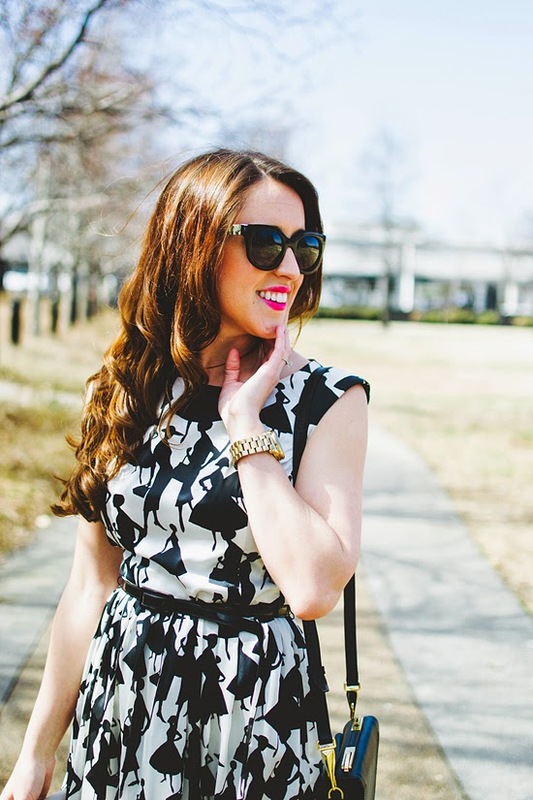 I love the print on this dress. I've never seen anything like it! 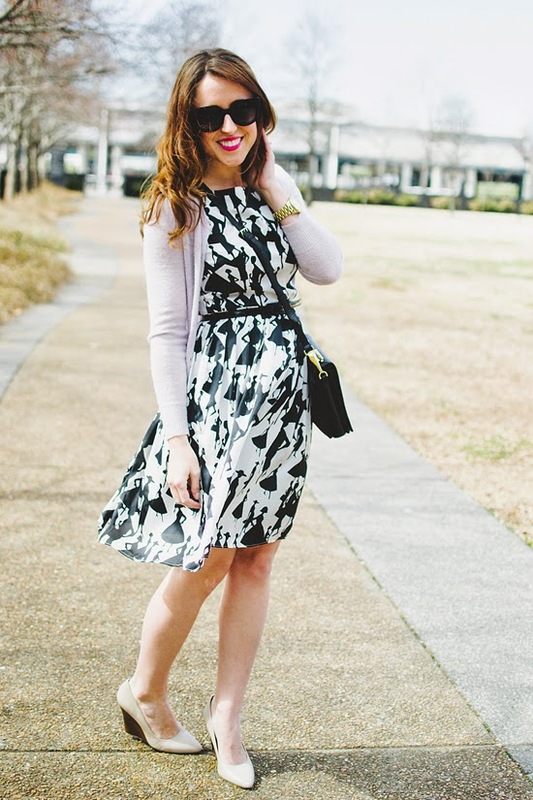 I am loving how you styled this dress! 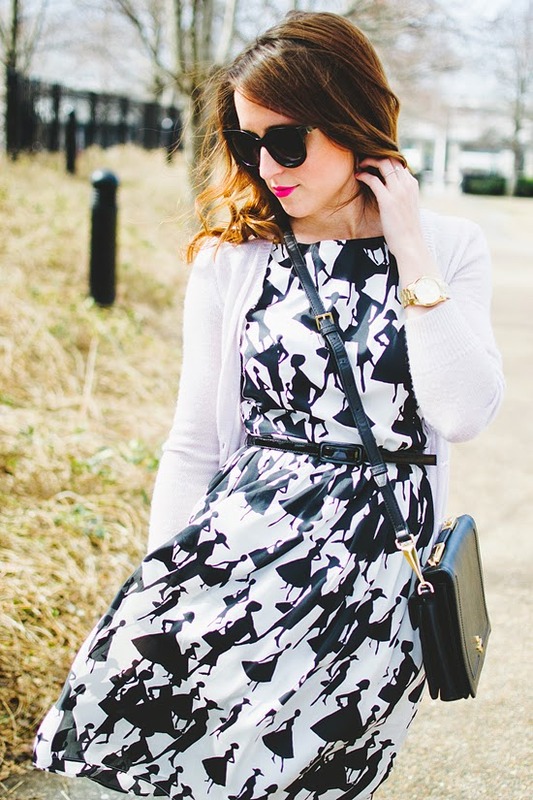 The black and white print is so lovely! The print of that dress is so adorable!! Love this whole look and such a great find with the bag! Also, what is the lip color?? Thanks lady - I really wanted to upgrade my handbag collection this year… my purses never really appeared on the blog in the past because they were old & only for utility, definitely not for looks! Now I have my brown Michael Kors work bag, gray Coach everyday bag, and this black cross body for throwing on when I want to be hands free. Totally agree, now that my handbag needs are taken care of, I don't even look twice at the trendy options… feels good to want & truly love what I already have! My other cross body bag love is the gray Rebecca Minkoff I got myself for my birthday last year… definitely recommend! You look absolutely gorgeous Jess! Love that lip color on you! that dress is beautiful! love the print! That is the chicest dress, EVER Jess! it took me a minute to figure out what the print was on this dress, i LOVE it! that picture of you laughing is absolutely gorgeous. you are one fab teacher for sure. I don't have any major shopping confessions...wearing something with the tag on and then returning it? does that count? sometimes I have to wear something to really decide if I want to keep it. Love the last photo of you! You look like you had fun with this shoot!